The Empress is often thought of as the Mother of the Tarot. She represents fertility and renewal. In the Rider/Waite/Smith deck she sits outdoors in a field of grain. Usually she is considered pregnant although it is not obvious. She holds a scepter and the shield at the base of her chair represents the goddess Venus. There are many more symbols in this card; myrtle leaves, the stars in her crown, the pearls in her necklace – and again we can go on and on. It is a lot to take in. 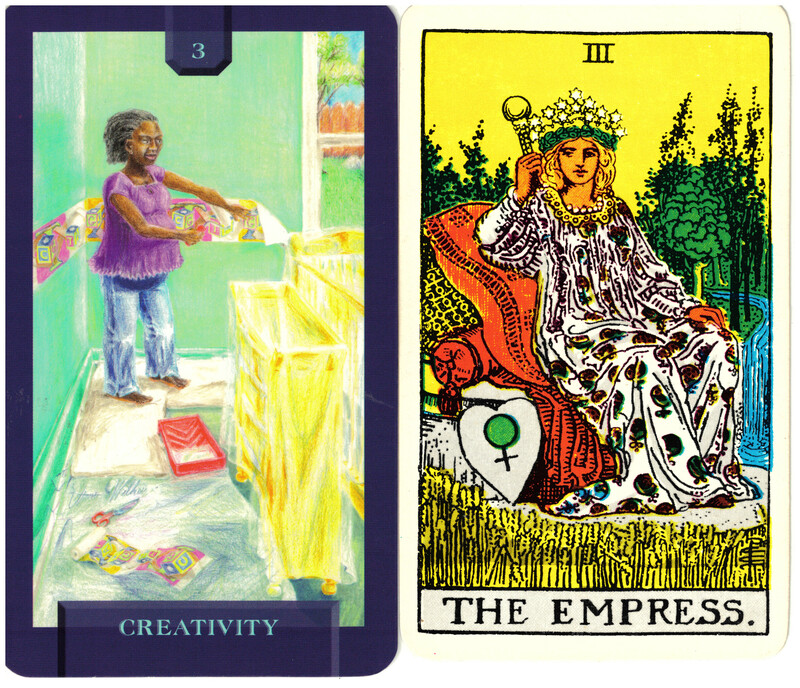 Today’s Journey Tarot shows a young mother-to-be designing the nursery for her child. It is easy to understand that she represents fertility and her creative endeavors on behalf of her child’s nursery further enhance that idea. The Empress is often associated with Mother Earth but Expanding Dimensions chose to keep the woman inside. We did however leave her feet bare to indicate a free spirit who is rooted to the earth. The room is painted green for growth and abundance. Our one indulgence with symbology in this card is the chair rail that she is applying. It has a baby block design with the letters of the DNA strands (GATC), the building blocks of life, where all creativity is manifest.